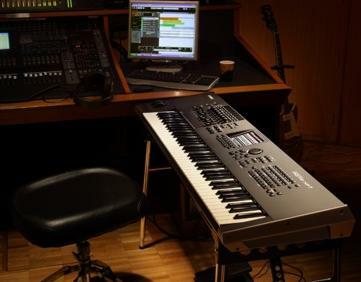 The Motif XF features 741MB of internal Wave ROM including realistic pianos, acoustic instruments and vintage synths and up to 2GB of optional Flash Wave memory. Finally it is possible to save your samples to the internal memory of your synth so they are always there when you turn it on. A sophisticated 8-element synth architecture with XSpanded articulation and 18 different filter types allows for shaping sounds anyway you want, and 8 front panel knobs and sliders make it easy to do - even in real time. 1664 Voices and 97 Drum Kits are available. 128MB of onboard volatile sample RAM are available- for user sampling, loading and auditioning sample libraries or adding vocals and real instruments. The improved user interface offers many user-requested features. The popular FSX (Motif XF6/7) and BH (Motif XF8) keyboard actions let you express your passion for playing with 61 key, 76 key and 88-note weighted keyboards. 512 Performances combine four voices and four Intelligent Arpeggiators to instantly create backing tracks with the intuitive Direct Performance Recording feature. An integrated Yamaha Digital Mixer includes 3-band EQ for each part, eight dual Insertion effects, two system effects, an overall master effect and master EQ. Direct-to-USB recording and playback lets you record your final mixes to any connected USB memory device as CD-quality WAV files, or play WAV files created on your computer back on the XF. Available are new large format (512MB to 1GB) Voice libraries from Garritan, Sonic Reality, Easy Sounds and more plus new Motif-specific software tools, including waveform editors, sample format convertors and arp managers.